On April 28, 1988, Aloha Airlines flight 243, halfway between Big Island and Maui, suddenly lost an 18-foot section of its front fuselage, due to metal fatigue. At 24,000 feet of altitude, the sudden decompression leaves room for panic in the cabin. 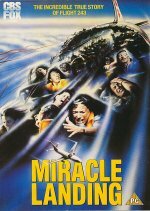 But in the flight deck, Captain Schornstheimer and First Officer Tompkins are faced with the difficult task of safely landing the crippled, barely-controllable airliner, as the title says.